Since I have a dance vein going on the Underground, allow me the indulgence to include a 2 minute film here that I have made earlier this year of my private dance student, M.
It was meant to give her a little showcase for all her hard work studying classical technique and as a tribute to our master teacher Stefan. We choreographed it together, I made her costume and styled her hair and make up. It's about a young girl's difficult moment of decision to leave her teacher and say goodbye even though she might prefer to stay with him. It was filmed at a beautiful Italian villa and gardens in Los Angeles. "Reverence" [rev·er·ence/ˈrev(ə)rəns/ to treat and honor with deep respect] is the bow she makes at the end of the piece. It's what all ballet dancers do at the end of every class in reverence and thanks to their teacher for showing them this secret sacred art. She is a lovely young woman now. I remember when I first started giving her private lessons at our teacher's suggestion. I've learned and grown so much. I will always be thankful to them both. 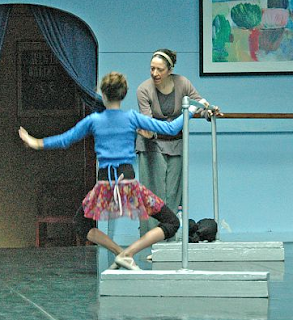 This is me teaching Maddie at the old studio when she was about 11, the same age I was when I began studying the same art with our same master teacher today. photo by M's dear father. Cool shelly- I love watching humans move. Very Nice. It just reminds me how darn much work goes into being able to dance at that level, she makes it look easy. Wish I knew more about dance, but I like how this is very pose-to-pose and every pose is clear. I can see why the best animators also tend to be good dancers. Hi Don, I think you are so right. Making this film, M was my little (real life) puppet! FUN! Thanks, Don! I think directing, from an art standpoint vs. a management one, is akin to designing. I've been a designer for nearly 30 years. So fingers crossed for this project being realized as art. I feel the editing and fussing I tend to do will easily be half (HA!) of the end results.